The release of the two, was greeted with wide jubilation by members of the royal family as some of those present at the Shehu’s abode when they were brought could not resist shedding tears of joy. The now freed Queen Hajju was abducted along with two of her children, a boy and a girl when the town fell to the insurgents two years ago. She however lost her son during the captivity in the hands of the insurgents. It was learnt that Nigerian troops rescued her and her daughter during their operations around Damboa axis. A source at the Maiduguri residence of the paramount ruler said the king could not hold back tears of joy on sighting the queen and his daughter. 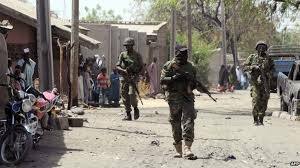 Meanwhile some residents of Maiduguri have started trooping to the abode of the ruler who was forced to relocate from Bama when the town fell to the insurgents about two years ago. Among the early callers at the residence include the Borno State Deputy Governor, Usman Durkwa and the wife of Borno State Governor, Hajiya Nana Shettima.